Poles are a popular feature of a window. We have every option covered from contemporary metal poles to luxury hand-finished made-to-measure wood and brass poles. We have straight poles, curved poles and poles for bay windows. The variety of poles and tracks is huge, designed with different styles, curtain weights, and fixing arrangements in mind. By way of introduction here is glimpse into the world of quality curtain poles. Don't let poles be an after thought! Here we have an affordable range of simply minimal metal curtain poles and coordinated accessories reflecting the desire for sleek design in the modern home. The 19mm, 28mm & 35mm ranges are available in four contemporary heavy gauge metal finishes with a choice of four finial designs in each diameter. The quality of the metal and the attention to detail in the fittings make these poles a pleasure to install and use. The solid, fixed eyelet, metal rings are lined with nylon so that they run quietly and smoothly. The fixed brackets are solid cast. The extendable cup bracket enables the pole to be fixed to uneven points on your wall. This is a substantial and sturdy metal pole collection influenced by themes from around the world. This collection is defined by the truly stunning finials which cleverly blend together natural materials such as stone, mother of pearl, beads, glass and wood with detailed metalwork that complements and enhances the intricate craftsmanship. The poles are available in a range of different metal finishes. The collection is offered in two pole sizes, 35mm and 50mm, with a choice of finials and colours in each. 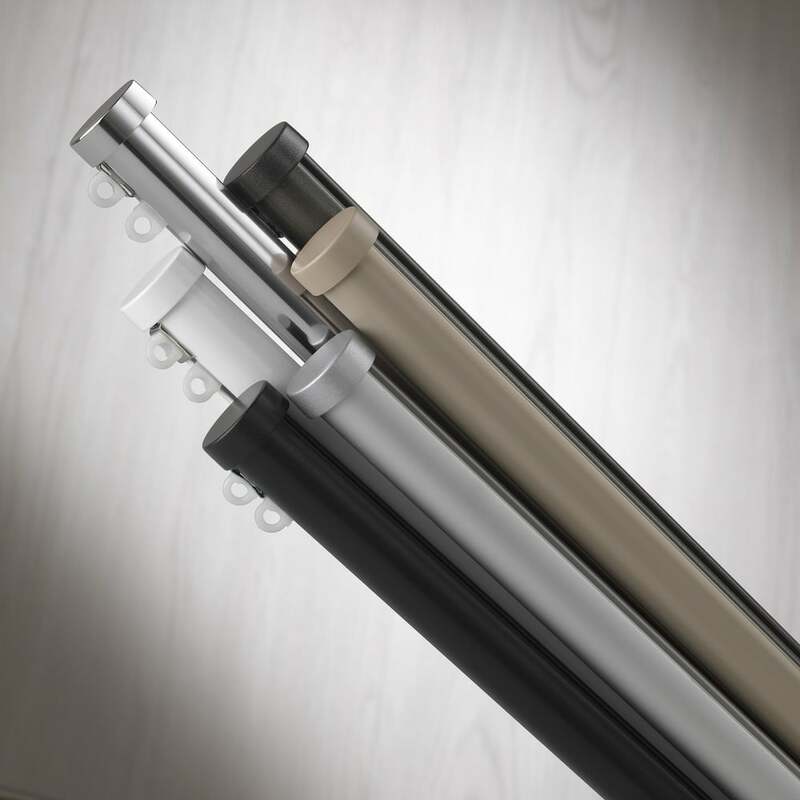 As well as offering new and very individual styling for curtain poles, these poles have gliders running in silicone treated aluminium channels unhindered by brackets or rings. So are they tracks or poles? Moreover the design of the profiles – hand or cord operation – makes them perfect for bay windows and other curved applications. Hand drawn are available in 23mm, 30mm or 50mm diameter or the ultra modern 36mm flat profile. Or cord operated in 30mm or 50mm diameter. The 50mm also has an electric motorised option too. They are also the only option for modern wave tape headings on your curtains. When you are selecting curtains, remember that poles and tracks are integral part of the design process. No longer do they have to be an afterthought. Many poles are designed to be a statement piece of furniture that can enhance any room. We don’t want poles or tracks to be an afterthought and we will help you find the right ones for your windows and curtains.